The event typically runs from 9am till 4pm, but sometimes later or earlier depending on the entry level. All Lothian Car Club national A events cater for National B licensed drivers as a separate event. We have, after much discussion increased the spectator admission price up from £5 to £7 per adult. This still makes a visit to the Doune Hillclimb one of the best value outings anywhere. The small increase will be used to fund some of the major safety improvements we are making to the track over the next few years. Next time you visit please bring a friend and spread the word. You may also like to consider joining Lothian Car Club as membership entitles you to free admission to all Doune Hillclimbs. Membership forms are available at the site office and also on our website. We are continuing to develop and improve the facilities at Doune and offers of help and/or sponsorship would be gratefully received. If you would like to learn more about being a friend of Doune and providing funding assistance then please contact a club official – either at the club office today or via our website contacts. To prepare and plan for each event at Doune takes a huge amount of effort and we are a relatively small club with few active members. If you feel you can lend a hand at work parties or on the day of the event please come and find an official of the Club and have a chat – your help would be greatly appreciated – Lothian CC officials are all wearing yellow shirts. Alternatively you can make contact through our website. 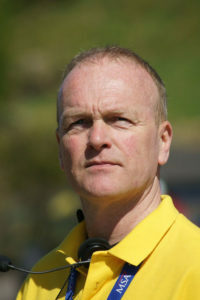 I would also like to take this opportunity to thank all the people and volunteers who help to make running Doune a success – marshals, scrutineers, timekeepers, medical staff, stewards, the commentators, committee members and helpers,Dunblane Scout Group, caterers, the drivers and of course the spectators. Please note these times are approximate and may be altered at the discretion of the Clerk of the Course. Please make sure you dress to take full account of the weather.